Want to know which books from yesterday’s new deliveries are already heating up and which ones are cooling? Here’s a “Day After” list that we hope will help! This isn’t a reflection on the quality, collectability or long term potential of recently released books. This is based on today’s market price for books that came out yesterday, Wednesday 12/9/15. They could still be at your shop. SO … there’s really nothing hot this week. This is a first for this list. I find that it’s really hard to walk into your LCS and walk out empty handed. When that happens, I get itchy and feel the need to buy something. There are some possible contenders below … feel out some of the new books below and take a gamble (I recommend Monstress 2nd print). 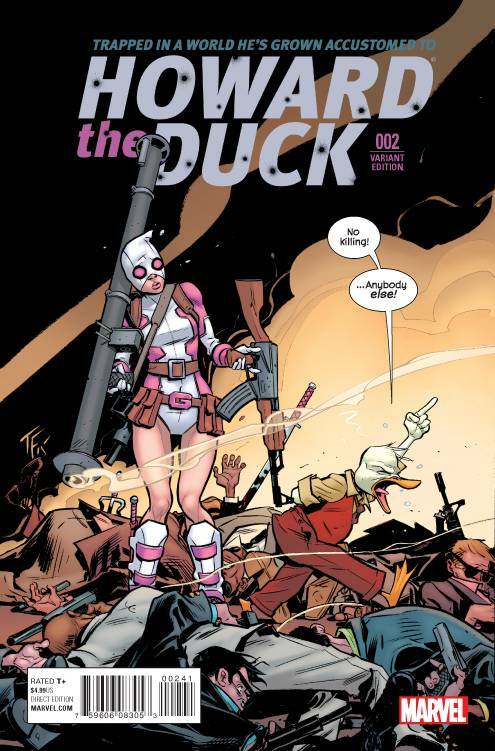 HOWARD THE DUCK #2 FOWLER VARIANT – As anticipated, this has dropped from last week’s $55 average to $35/$40 currently. And yeah….. there’s nothing really warm. Tough week! AIRSHIP ENTERPRISE #1 – Antarctic Press’s steampunk book….. it appears that the market has little interest in this theme currently. BATMAN #47 – There are a ton of the Alex Ross Black Book variants listed right now. Unless you feel super lucky at finding an original sketch “Golden Ticket” copy, these are PC books only. BATMAN / TEENAGE MUTANT NINJA TURTLES #1 – The 1:50 is selling for roughly $35 (+shipping). That seems really low for two properties that both have a huge fan base and a strong entertainment presence right now. CONTEST OF CHAMPIONS #3 – This book would have seen some solid movement IF Marvel was smart enough to put Venom Hulk on the cover. There is a blank cover for this though……. that could present some fun opportunities. DEADPOOL #3 LIEFELD VARIANT – I really debated putting this in warm… but $20 average sales is just not great for a 1:20 variant, let alone for a Deadpool variant. GWENPOOL SPECIAL #1 – All of the covers are pretty static. KLAUS #1 (2ND PRINT) – There are only a few listed with none sold. The two up right now are for $8. Interest dipped for this book since issue 1’s release…..however, this second print seems hard to find. MONSTRESS #1 2ND PTG – However, there’s only 1 copy currently listed on eBay. If this book really does take off, I can see this being the cover to get. It wouldn’t be a bad idea to grab 1 if you see it…… just in case. STREET FIGHTER UNLIMITED #1 – The 1:40 is pretty cool …..and it’s selling for about $30. If your store under priced it, grab it! Pair it with the 1:20, which is selling for $17. SUPER NHS (Antarctic Press 1-shot) – Nintendo homage, looks kind of fun. SYMMETRY #1 – Matt Hawkins is solid and I’m a huge supporter. Top Cow is way underrated. I recommend picking up a copy. Totally. That’s exactly what I was thinking. I almost never buy variants, but I HAD to pick up the Steve Epting “1992 leather jacket Avengers!” Black Knight cover! That thing is gorgeous! As well as the Bill Sienkiewicz Scarlet Witch variant, because he’s one of my favorite artists! ALWAYS buy what you love and you’ll never go wrong! One of my favorite covers that came out in the past couple years is Amanda Conner’s Catwoman variant to DC’s Convergence #7. It’s worth $5. But I absolutely love it. 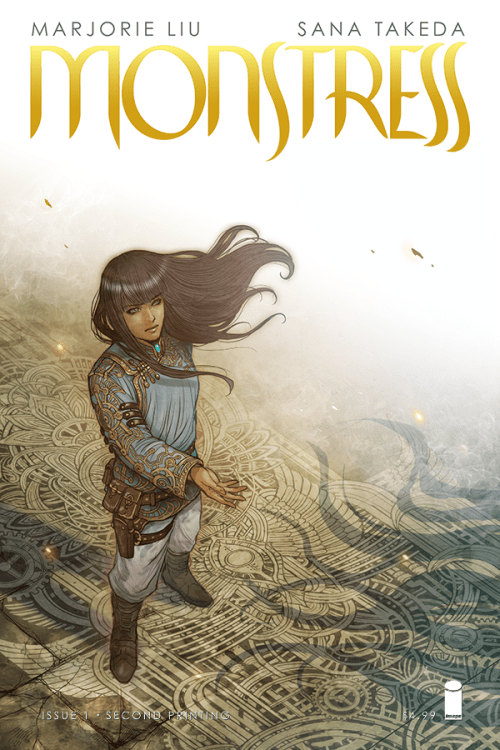 I’ve been strongly recommending Monstress to all that will listen. That 1st issue is amazing. Like 48 pages of fresh story telling and lavish art. its worthy of all the success it is having. I am waiting on the print run numbers for November to be published to see how many 1st prints of #1 are actually out there.. I am guessing its less than 30K because it went to a 2nd print. and that 2nd print has a great cover so i will probably buy more of that too. I’m thinking the print run for a non-superhero book priced at $4.99 will be closer to 10K (we’ll know soon). The second print would be half that or less. Now, watch for demand as #2 gets a second printing (reorders were high but again it’s a $5 book) and wait for it.. #1 goes to a third? And it’s a great story with great art! 2nd printings will rule 2016. You heard it here first. 3rd printing on the way (as predicted). Print run ended up being around 25K.